I would like to know about common ear problems in dogs. Also, just what we need to do to keep them healthy? Ear infections are a frustrating problem for all concerned, especially those chronic ear infections that just keep recurring. You’ll be frustrated that your vet isn’t solving the problem while vets are frustrated that clients aren’t returning for the revisit so that they can ensure the infection is resolved or possibly by a process of elimination to discover the underlying cause. Otitis externa or otitis media? Most ear infections will involve just the external ear canal (infective otitis externa) but sometimes if the ear drum is perforated there will be a middle ear infection as well (otitis media) which is more complicated to treat. If the eardrum is perforated then any ear cleaner or medicated ear drops that are instilled into the ear can reach the inner ear (cochlea). A problem is that many ear cleaners and medicated drops are toxic to the inner ear and so may cause hearing loss or even affect the adjacent vestibular organ which can cause circling, nausea and balance loss. Chronic infective otitis externa often will eventually rupture the ear drum and so if your dog is being treated with a ear preparation and suddenly has symptoms such as hearing loss, circling and having balance difficulties or even nystagmus where their eyes are flicking repeatedly to and fro, then you should stop the medication immediately and revisit your vet as soon as possible. Sometimes it’s easy diagnosing the underlying cause of your dog’s ear problem where they are suddenly shaking or scratching at their moist and possibly smelly ears and we find something obvious like a grass seed in the ear canal or you report that they had been swimming or been bathed a few days previously. Foreign bodies and water getting into the ear canal are frequent causes of otitis externa. After removing the foreign body from the ear or confirming that there isn’t a foreign body there but ensuring that the ear drum is intact then most vets would dispense a medicated ear drop preparation for at least 5 days to clear any infection. Don’t be surprised if the vet takes an ear swab sample to make a smear on a microscope slide and then stain it and take a look under the microscope. Seeing whether the ‘bugs’ are yeast (Malassezia species), cocci shaped bacteria (usually Staphylococcus or Streptococcus species) or rod shaped bacteria (such as E.coli, Proteus, Klebsiella or the dreaded Pseudomonas species) can help the vet decide which medicated ear drop is the most likely to be effective. Most medicated ear drops will contain an antifungal ingredient that is active against yeast, an antibiotic and usually some cortisone. We’ll often also use systemic cortisone whether as an injection or tablets to help settle the inflammation and discomfort. In ears that look particularly infected with bacteria we might also use systemic antibiotics in addition to those in the ear drops. Sometimes diagnosing the underlying cause isn’t easy, especially if the otitis externa has been present a long time and /or is recurring. Over time any inflamed and infected ear canal regardless of the inciting cause will fill with exudate, the walls of the ear canal become swollen and this makes it even harder for the exudate to drain out of the ear. Sometimes even polyps can form as a result of chronic inflammation which further obstructs drainage out of the ear canal which is needed if the problem is ever going to be resolved. As mentioned earlier, the eardrum may be perforated which may be impossible for the vet to detect because the ear canal is full of exudate. There may even be a grass seed hidden amongst all the exudate within a very narrow ear canal which will be very painful to examine with the otoscope. This is when the vet will often recommend a general anaesthetic which will allow them to take swabs for cytology as mentioned earlier and even for culture and antibiotic sensitivity testing especially if previous antibiotic ear medications haven’t cleared the infection. Your vet will flush the ear with warm saline to clean the ear until they are assured that the ear drum is intact. If the eardrum is intact then they may send your dog home with ear cleaner solutions and medicated ear drops pending any culture results as well as antibiotic and sometimes antifungal tablets and maybe cortisone injection and /or tablets. If the eardrum is ruptured then we are usually looking at long courses of systemic antibiotics and judicial use of ear medications that are known to be less likely to cause inner ear toxicity. Once the otitis media is resolved the eardrum will usually heal and become intact and functional again. Revisits are important to ensure the infection resolves and sometimes your vet may want to repeat cytology and even ear culture and antibiotic sensitivity testing if the infection isn’t responding to treatment. Typically with ears that look like they have had issues with inflammation and wax build-up leading to infection over a long period of time, I’ll recommend ongoing use of an ear cleaner solution once the ear infection has been resolved with medical treatment. This is where vets can become frustrated because a client may be happy that their dog’s ear infection has cleared and doesn’t revisit as we have requested. What may happen is that gradually the wax builds up in the ear due to recurring irritation, whether due to allergies or simply the dog is one who produces excessive wax like many Spaniels do or sometimes because the ear canal is so narrowed due to scarring and polyps resulting from recurrent infection that even a normal amount of wax can’t drain out of the ear properly. So over time a warm, moist and waxy environment develops that bacteria and yeast will thrive in and cause yet another infection. Those dogs with very narrowed or stenotic ear canals sometimes need surgery to remove the outer wall of the vertical component of their ear canal (lateral ear resection) or even removal of the entire ear canal (total ear ablation) to allow adequate drainage from their ears and so resolve their chronic painful ear disease. Not all ear cleaners are the same. Some that contain alcohol are best for those dogs that go swimming a lot and are useful in drying the ear. Some dogs that are prone to yeast infections do better with ear drops containing mild acids such as Epi-otic ear cleaner or the recently discontinued Malacetic ear cleaner. These cleaners are also handy to use with cotton wool where you can moisten a cotton wool ball with the ear and skin cleaning solution and use it to wipe out and clean those areas where yeast love to grow such as the moist nasal fold in Griffons and Pugs. However, mild general purpose ear cleaning solutions like Paw Ear Cleaner are quite useful for cleaning the ears in most breeds including our Griffons. So, if your dog’s ears appear waxy with that brown/red material visible at the opening of the ear canal, then you fill the ear canal with ear cleaning solution until it has filled the ear canal and is starting to overflow out of the ear. Then fold the ear flap over the opening and massage the ear for several seconds, you should hear some squelching noises as you do this. Then finally, after you allow your dog to shake the excess solution out whilst taking care that you aren’t dressed in an evening gown or dinner suit, take a dry cotton wool ball and with it over the end of your index finger we wipe out wax and excess cleaner as deeply as you can from the ear canal. Even with large breed dogs you can’t possibly penetrate too deeply into the canal and damage the eardrum using your finger and a cotton wool ball or two, but you can potentially cause damage if you use an ear bud. Don’t use tissues as they can cause too much irritation and certainly never use water for cleaning ears. Usually I’ll tell clients to do this once weekly and when the cotton wool appears clean after wiping out the ear to then reduce the frequency to say fortnightly and even monthly. Using ear cleaning solutions too frequently when they aren’t required can actually become irritating to the ears over time. Sometimes if the ear canals are particularly hairy then it can be useful to pluck the ears from time to time and using your fingers whether or not with a rubber thimble or using a disposable glove, is the safest way to do this. Ned having his ear instilled...........................massaged.............................and wiped clean ! If a client has been regularly cleaning their dog’s ears and yet they revisit with clean but inflamed ears on examination, then we’ll suspect an underlying allergy. The most common allergy causing ear problems in dogs are where they are allergic to pollen or even house dust that they are inhaling. Inhalant allergies are also called atopy and are actually quite common. Those little white breeds of dogs are especially prone to atopy but it can occur in any breed. Dogs suffering from atopy may also chew and lick their feet excessively as well as have other skin irritations. Your vet may prescribe cortisone tablets or cortisone ear drops to use and may discuss feeding a low allergy diet (hypoallergenic diet) for at least a two month trial. I know that I said that atopy is more common but sometimes a food allergy can be involved and the only way to eliminate this possibility is trialling a diet that the dog is unlikely to be allergic to. If that fails then your vet may discuss atopy testing. There are blood tests available that can detect antibodies responsible for allergies against many common pollens, house dust and fungal spores. A veterinary dermatologist can test for even more allergens by doing skin patch testing. Once the causes are known the dermatologist can prescribe desensitising injections that might mean that cortisone no longer needs to be used or at least at a lower dose. Alternatively, a drug called cyclosporine (Atopica capsules) which is quite effective in controlling atopy can be used once the diagnosis has been made after blood and or skin testing. Many clients opt to use cortisone tablets at the lowest effective dose especially if the dog doesn’t suffer marked side effects because atopy testing and treatment with cyclosporine or desensitising injections can be expensive. Young puppies and ear mites. 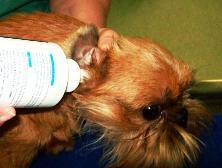 Pups are different in that they frequently will have ear mite infestation. They will typically have a waxy brown/red discharge because the mites are very irritating and the ear will produce more wax than normal. Yeast and bacteria enjoy the warm, moist and waxy conditions found in an irritated ear canal and can quickly create a secondarily infected ear. If your vet can see ear mites then they may recommend a product like Revolution or Advocate to be applied topically to the back of the head or neck monthly as these are really very effective treatments to eliminate mites. 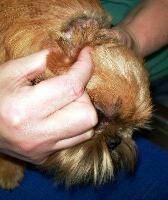 Sometimes the mites may be in such low numbers that we can’t see them but they’ll still incite that waxy discharge and your vet will still quite validly recommend treatment for ear mites in a young puppy with waxy ears. If the ears are infected then they might dispense a medicated ear drop or if they are just very waxy then they may recommend an ear cleaning solution to be used to prevent an infection from developing whilst treating the ear mites. It is important that any adult dogs in contact with the puppy are treated too because ear mites are obviously spread by direct contact between dogs and are usually caught from the pup’s mother. Using an ear drop that has an ingredient active against ear mites often fails. You might clear the infestation from the ears but mites can survive outside the ear canal and they’ll reinfest the ear after the ear drops have finished. Revolution or Advocate will kill the mites wherever they are on the dog as well as fleas, heartworm larvae and other parasites. Apart from treating the underlying cause of the ear shaking, your vet will often recommend draining the blood from the ear flap because if left undrained the dog will get the canine equivalent of a cauliflower ear. This is because of the contracting scar tissue that forms as the blood is broken down and removed by the inflammatory reaction that follows any haemorrhage. There is no one universally popular way of treating aural haematomas so as to minimise permanent contraction and deformation of the ear but sometimes a small haematoma might be treated by simply draining blood from the ear flap using a needle and syringe and then injecting a small dose of cortisone into the now much smaller haematoma. Larger haematomas might be incised and drained under a general anaesthetic and a small drainage tube or a larger absorbent pad is then sutured into place to remain for the next two to three weeks while blood continues to drain out of the haematoma as the skin and cartilage layer gradually heal back together again. I prefer the simpler and quicker drainage tube method of treating larger haematomas but no matter how careful we are there are some haematomas that just recur much like the ear infection that often caused them.